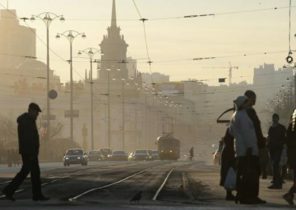 In Ukraine in the next month, again more expensive electricity. “Dear” light of Ukrainians forced to think about saving. 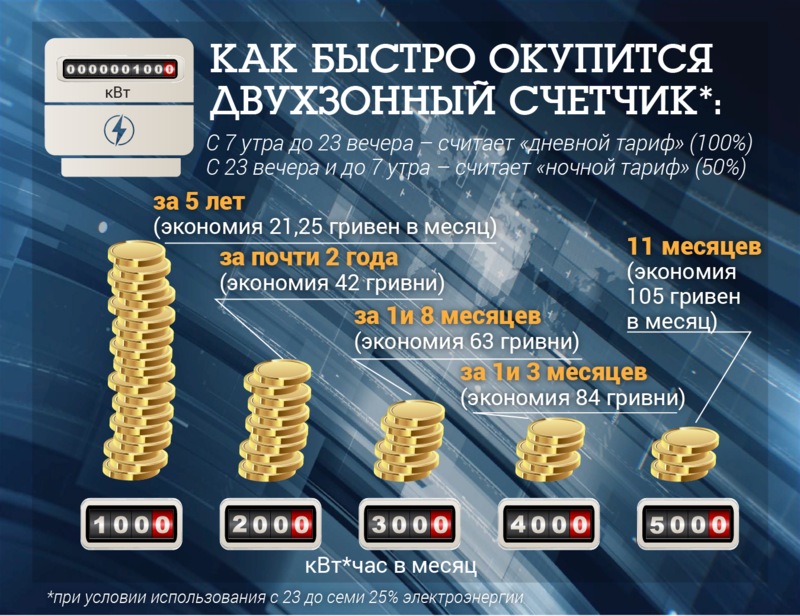 So, last year the number of Ukrainians with dual-zone electricity increased 1.6 times. Thus spent on the purchase counter, the money can be recouped for several years. “Today,” found that this is advantageous to install dual-zone counters. Only over the past year, 154 thousand Ukrainians have established a multi-zone electricity. 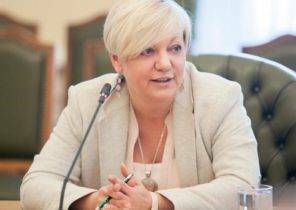 According to the national Commission, carrying out state regulation in spheres of power and utilities (NKREKU), at the beginning of this year, 400 thousand Ukrainian families are multi-zone counters. On average, this allows you to pay for electricity 25% less than estimated in the Commission. Considering that only in a country of 15 million households, the majority of Ukrainians, this opportunity is not used. Dual counter from 23 PM to 7 am believes electricity at the rate of two times lower. This meter installation will cost around 1400 USD. For example, a family that consumes 200 kWh of electricity and 25% of the world uses, from 23 p.m. to 7 a.m., every month can save the 42nd hryvnia. Consequently, dual-zone meter will pay for itself in about three years. In August last year, the Cabinet allowed the Ukrainians plan to open more counters, not just service providers. In addition, the resolution determined the terms of the parameterization of the counter. 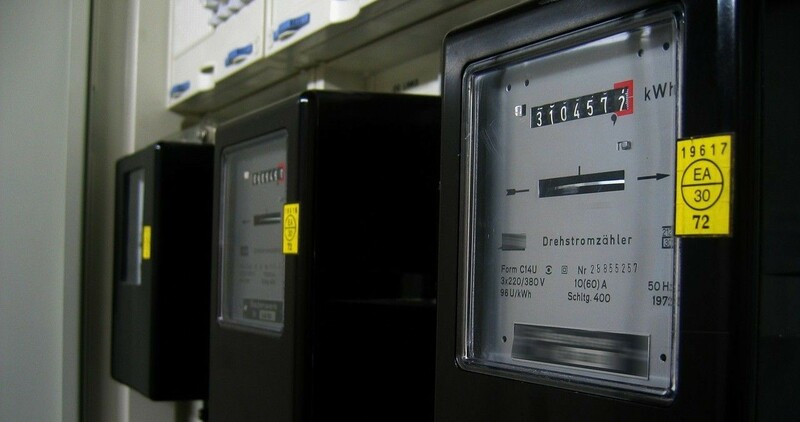 “This is a very important decision, enabling consumers to choose and purchase the meters, and thus destroyed the monopoly of power companies on their sale”, – quotes the head of Dmitry NKREKU wolf. By the way, the most energy consuming washing machine, electric kettle, microwave, electric water boiler (if any). If you use these devices in the “night” time is a dual-zone meter will pay for itself quickly. 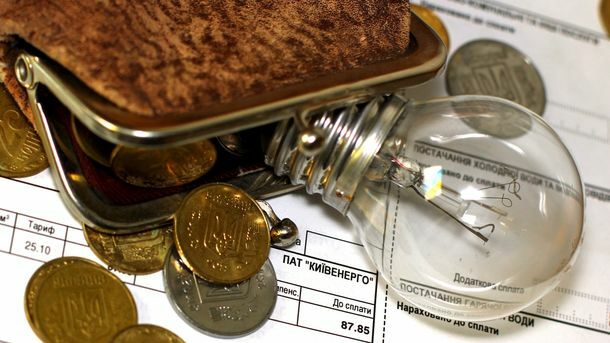 In 2015 the national Commission decree №220 approved a gradual increase in the cost of electricity. The last stage falls on March of 2017. 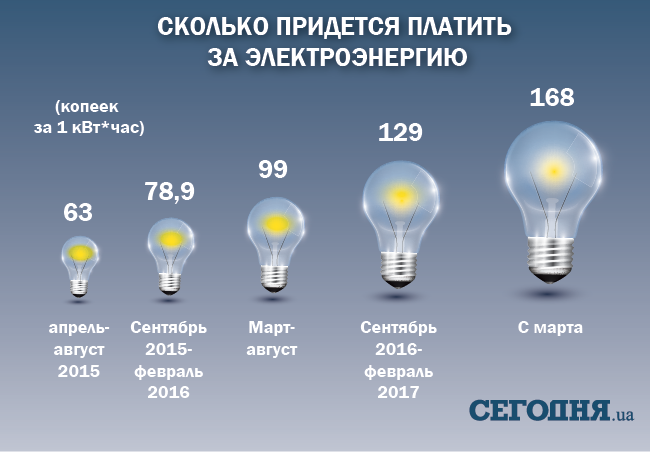 In the beginning of the year Ukrainians pay for each kWh when the consumption is less than 100 kW 71.4 penny, and from the first of March – 90 cents. If consumption more than 100 kWh each kWh until March, worth 129 cents, and after Mar – 168 cents. The electricity tariff covers only 21.3% of its value, explained in NKREKU. Industrial enterprises pay extra for the population and kompensirovat additional expenses due to the final prices on their products. Last year the national Commission has decided to raise the tariff for Ukrainians to the level of costs. By the way, the cost of electricity depends on the tariff for water, which will also review this year. 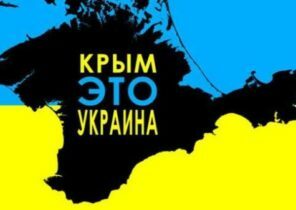 As stated in the presentation NKREKU, on average, for Ukrainians, the cold water will rise by 9%. Kyivvodokanal plans to raise the rate of 16.4%, at the same time in the southern water will rise by only 6.2%. As explained in the Commission, businesses must submit applications to establish new tariffs up to August 10. After that NKREKU new tariffs approved. At the end of last week, city officials –Deputy mayors – presented to the Commission the new tariffs, you can view them at the link. 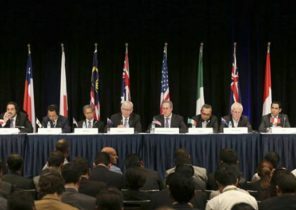 Almost all officials unanimously endorsed higher tariffs in their cities. “The new rates are approved by local authorities. The rate should correspond to the costs incurred by the company. 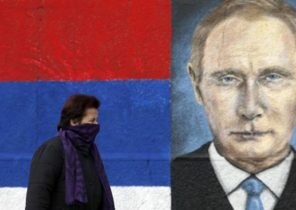 Should not be social populism,” – said the Deputy mayor Dmitry South-Loving. 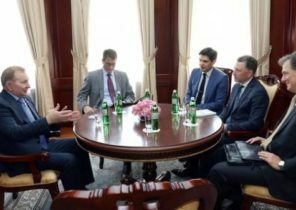 After the phrase repeated dozens of colleagues and officials from different cities of Ukraine. “Together with the whole family explore the payment system for electricity. Consider what appliances you use, how much they consume, how many in the apartment of incandescent bulbs. Define your family as a responsible energy Manager, which would monitor the use of electricity and was responsible for her savings. 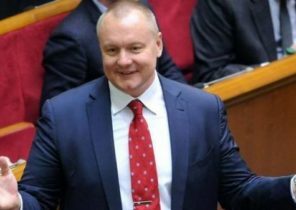 This will serve the students,” advises Manager of DTEK ESKO Sergei Svistun. An expert in the field of energy efficiency Anna Shumeiko said the first step to energy conservation may be changing bulbs. Energy saving bulbs will help one-third reduction in electricity consumption. Compact fluorescent lamp 23 to 27 watts gives as much light as ordinary light bulb at 100 watts. By the way, energy saving lamp can be recouped in just 9 months. So, a lamp with a capacity of 0.022 kWh you can buy for 98 USD. For example, to replace all the bulbs in a Studio apartment (for one lamp in the kitchen, in the bathroom, the hallway and the bathroom and three in the chandelier in the room) will need 686 USD. If the lamp power of 75 W in the hallway for two hours a day, in the toilet – an hour in the bathroom 3 hours in the kitchen – 5 hours in the room – 6 hours per month only for “light” typed 65,2 kW. At the same time, energy-saving lamps will spend in the same conditions 19 kW. 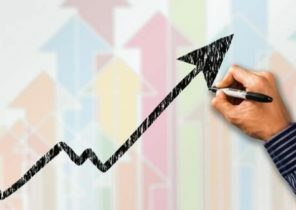 At the moment, every kilowatt of 1.29 is the hryvnia (the consumption of more than 100 kW), and from March 2017 the rate will increase to 1.68 hryvnia.